SSASS instructors are certified under the Canadian Association of Disabled Skiers (CADS) standards. Becoming a certified instructor is extremely rewarding but it does require some time and commitment. Naturally you need to be reasonably adept at downhill skiing or snowboarding. CSIA certifications are very welcome but are not mandatory. You must have a desire to help those who would otherwise not have the opportunity to partake in the sport. This needs patience, more patience and ski teaching ability plus creative problem solving to adapt traditional ski techniques to the unique needs of your student. The best place to start is to email the association president and set up a time to talk about the program. You can also drop by the SSASS room during the ski season and speak to any of the instructors. If it looks like a good fit for you, go on line and register. Our membership database, registration and scheduling are all done on the web through the SSASS Members Portal. Sign in as a new instructor and fill in as much as you can in your personal profile. This includes contact information, references and snow sport certifications. As part of the application process, you must complete a criminal records check. The instructions are in your profile on the SSASS Portal. The results of the check are returned to us. Should you wish to review the results, or use them for another organization, they will be available to you in your profile. Every year you must join the BC Adaptive Snow Sports Association. You can apply here and pay by credit card. BCAS represents the Canadian Association of Disabled Skiers (CADS) in BC. Your CADS card then comes via email. Print it and carry it at all times while skiing with SSASS. Membership gives you liability insurance when teaching with SSASS. Silver Star Mountain Resort also generously provides a 50% discount on lift passes when you show your CADS card. Remember to update your members profile with your CADS number. and be CADS certified in one or more of the adaptive disciplines. Until you are certified, you may teach together with another instructor only. You will be assigned to work together with a certified instructor who will assist you in obtaining the training necessary to complete your certification as quickly as possible. If you have started the on-line registration process you will have seen a link for the online form. Please complete this form and submit it electronically as the instructions indicate. The results will be sent directly to our office. We will notify you of the result which will be available to you in your private profile. From here you may download your CRC should it be required by another volunteer organization. SSASS will pay for all costs associated with the CRC. If you have completed a CRC for another organization within the last five years that will suffice. Please upload the CRC result to your profile. SSASS recognizes a CRC as valid for five years from the date it was issued. After this time the process must be repeated. Each year for which you do not have to complete a CRC, you must download, sign and upload a voluntary declaration stating you have not been arrested for offenses that would cause you to fail the CRC. CADS requires that every instructor have 6 hours of instruction on general CSIA skills similar to the CSIA Level 1. Training days are scheduled periodically through the winter. You should have your 6 hours by the end of your first season. Watch the training calendar for upcoming training dates. Autisim/Cognitive is 90% of our student population. This is the minimum CADS discipline to teach at SSASS. 3 and 4 Track refers to the use of outrigger ski poles used by students who with physical impairment to the legs or lower body, or overall weakness that requires the use of specialized mobility equipment. Sit-Ski is a sled like apparatus used by students who cannot remain upright for any of a number of reasons. The module teaches the instructor to control a student in a sitski and the skills necessary to ski independently. Stagecoach is a subset of the Sitski module that is unique to SSASS. 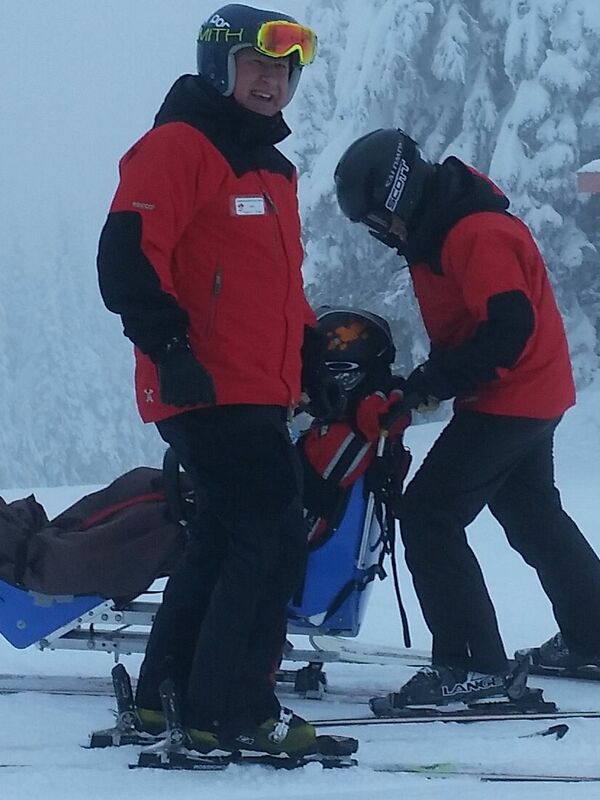 The instructor is taught to safely steer a sitski student up and down the mountain.